Beaches Watch is seeking nominations for the 2017 Friend of the Beaches Award. The Friend of the Beaches Award is an annual award that recognizes individuals, businesses or organizations for exemplary contributions that have enriched our quality of life at the beaches. “Through the Friend of the Beaches award, we want to recognize the positive things that are happening in our community”, said Beaches Watch President, Sandy Golding. Detailed reasons for the nomination. Please list things the nominee has done that have enriched our quality of life at the beaches. Nominations should be submitted by 5pm, Friday, Feb. 24, 2017 to info@beacheswatch.com or mail to Beaches Watch, Inc., P.O. Box 50311, Jacksonville Beach, FL 32240. The Friend of the Beaches Award will be presented at the annual Member Social in April. Recipients will be honored at the social for their contributions and will be awarded the Friend of the Beaches plaque. 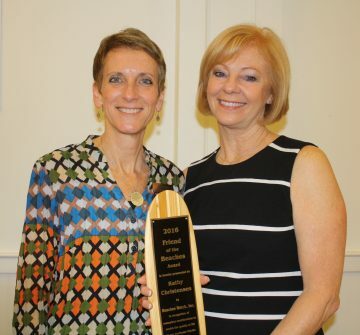 Previous award recipients have been the Kathy Christensen, Beaches Branch Library, St. Johns River Ferry Task Force, the Beaches Green Market, River Branch Foundation, Mario’s by the Ocean, Mary Emerson-Smith, Bennie Furlong and Marcy Silkebaken.